In October 2017 we found ourselves running around all over the place, from Norway to Lancashire, but the photos below are from Hill House in Helensburgh, much closer to home, well what was home when I was growing up, the west of Scotland. Hill House was designed by Charles Rennie Mackintosh and he was incredibly lucky to be commissioned to design not only the house but everything inside it too, very rare for an architect I think. It’s only recently that The National Trust for Scotland has allowed visitors to take photographs of the interior. The house was built between 1902 and 1904. 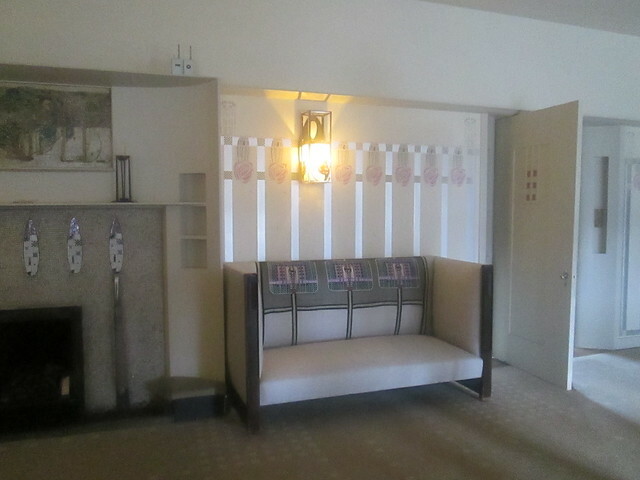 Mackintosh was keen on light and dark so a lot of the woodwork is black, but really that serves to be a wonderful contrast to the beautiful cream coloured rooms. It was practical too I think as the hall and stairs are dark, places that would have been quite difficult to keep looking absolutely pristine, especially as this was designed as a family home – for the Scottish publisher Walter Blackie. 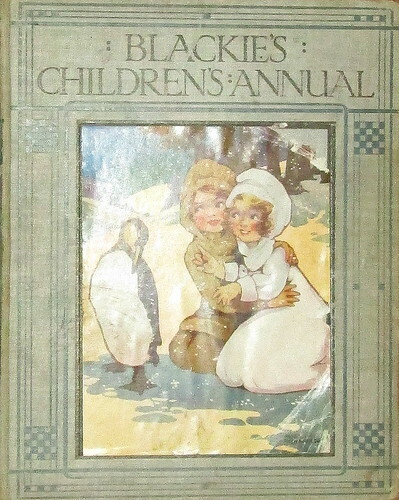 If you have some old Blackie books the binding will almost certainly have been designed by Mackintosh. The photo below is of a small hall table as you can see the design is arts and crafts. His designs are a mixture of arts and crafts, art nouveau and Japanese. 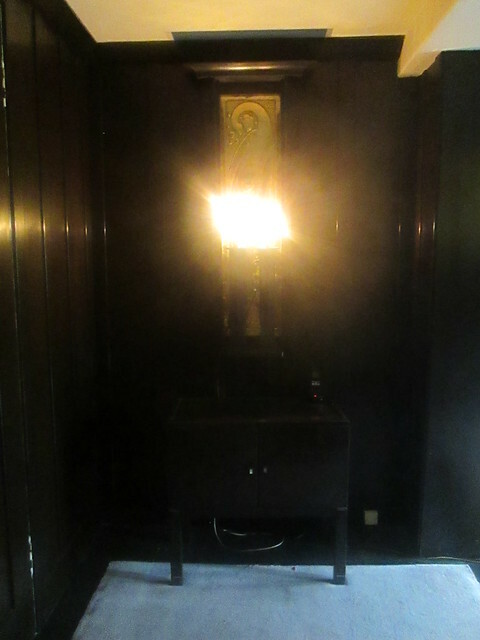 A very dark stairwell entrance below, unfortunately very difficult to photograph becaus eof the wall light. 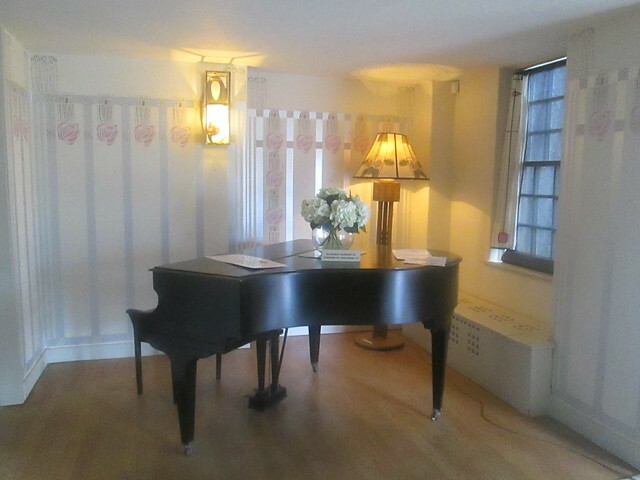 The drawing room below has a handy niche for the baby grand and as you can see the room is nice and bright. 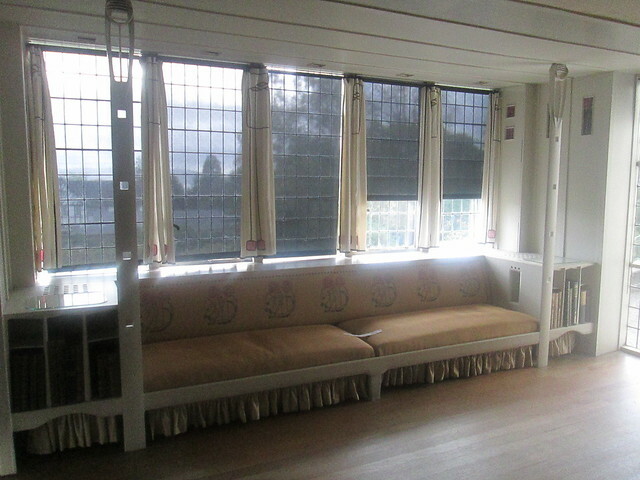 Below is another view of the drawing room. And another view of the drawing room. 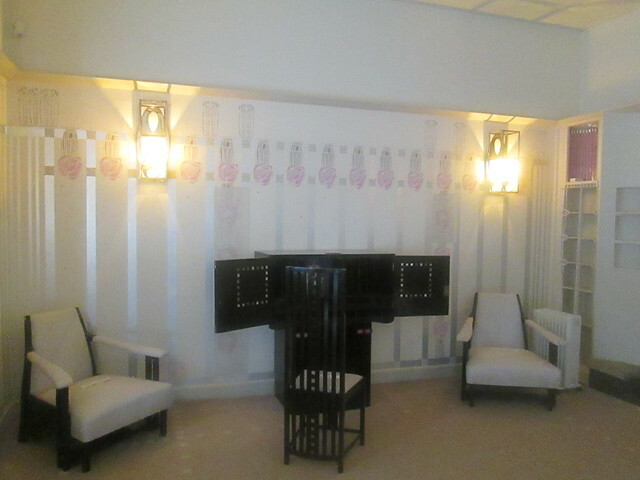 Mackintosh and his wife Margaret Macdonald worked as a team on this project with Margaret designing and making some of the art works and soft furnishings. She embroidered the settee backs which are still in reasonable condition considering how old they are now. I have plenty more photos but they can wait for another blogpost. Sadly Mackintosh used Portland cement on the exterior of the building, it was a ‘new wonder product’ according to the manufacturers. But in the damp climate of the west of Scotland it was a disastrous choice as it drew the moisture into the fabric of the building causing lots of problems. Now they are even thinking about building a huge glass structure over the whole house to try to preserve it. Desperate measures! On our pre-Christmas visit to Glasgow we ended up way up at the top of Sauchiehall Street, we hadn’t meant to walk that far but it was a nice bright day and we just kept finding more and more good buildings for Jack to photgraph, he’s a bit of an art deco fan. Anyway as you can see from these photos we decided to hike up to the Art Nouveau Glasgow School of Art as it was so close to where we were, and I mean hike, I had forgotten how steep that hill is! 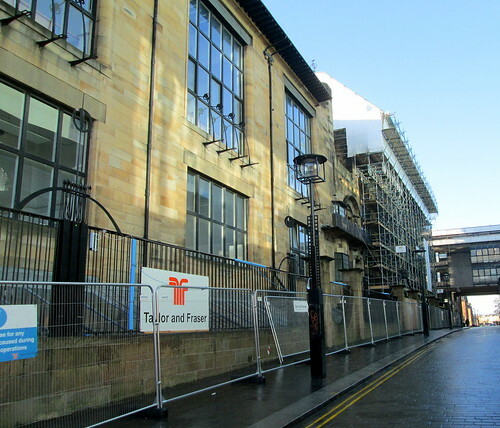 As you can see from the photos a large part of the building is swathed in scaffolding and I think some sort of covering has been put over the top, to keep the rain out. There was a chap on the TV recently saying that they should NOT rebuild the library and the rest of the damaged building as it was, but should add on a modern design instead. I really hope that that was just some hopeful architect in wishful thinking mode because although a newly built Mackintosh building is obviously not going to have the same history as the original, it’ll be an awful lot better than some random structure being tacked on to Mackintosh’s masterpiece. As you can see from the photo above the undamaged part of the building has some lovely details but apparently his designs were always practical as well as pretty. The metal brackets at the windows were for the window cleaners to put their ladders against. I still wouldn’t fancy that job though. If you’re interested you should have a look at the lovely images of The School of Art here. I think it’ll be scandalous if a decision is taken not to rebuild the damaged parts of the building as they were originally, apart from anything else a new extension to the Art School was just opened across the road from the original – and it is in a modern architecture style, and I bet it doesn’t last anything like as long as the old building has, I give it 30 years! 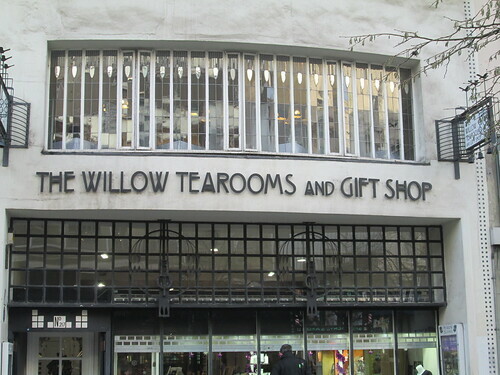 On our recent stopover in Glasgow I had thought that we might have our lunch at one of The Willow Tearooms in the city. But we were too busy photographing the loads of gorgeous buildings nearby, so we ended up just having Cornish pasties – on the go. Next time we’ll be more organised. 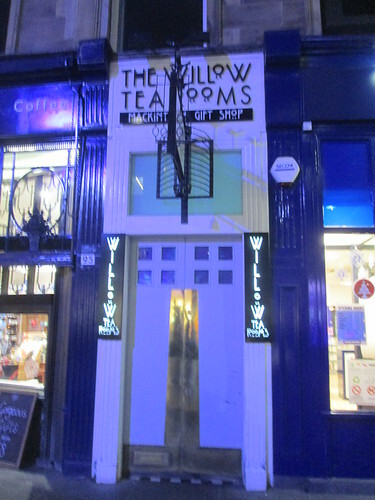 These tearooms were designed by Charles Rennie Mackintosh – as I’m sure you will have realised. 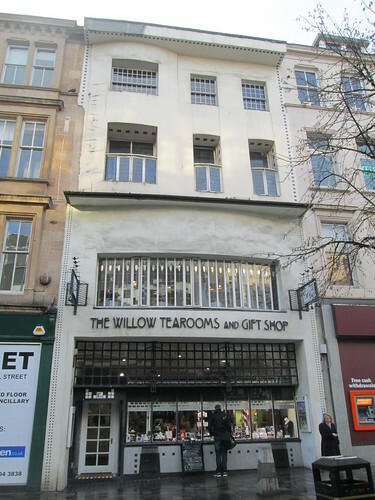 The photos above are of the tearoom at the bottom of Buchanan Street. You can read about them here. 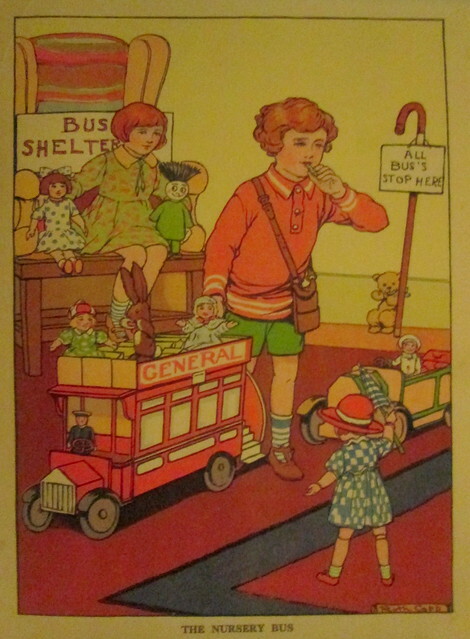 The actual tearoom is upstairs I believe. 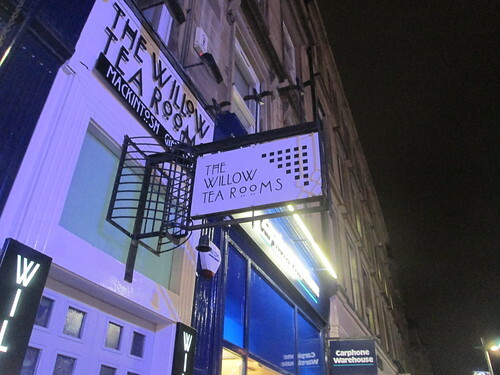 The photos below are of the tearooms at the top of Sauchiehall Street. These have only fairly recently been opened as a tearoom again as the building had been taken over by a jewellers for some years. I think the windows of this one are wonderful. You can see images of the tearooms here. It was Miss Cranston who commissioned C.R. Mackintosh to design her tearooms for her and you can see the original interior in the Kelvingrove Art Galleries in the west end of Glasgow. There are more images of The Miss Cranston interior in the gallery here. Nowadays of course there are gift shops alongside the tearooms. There’s so much Mackintosh inspired ‘stuff’ around that we have taken to calling it Mockintosh. 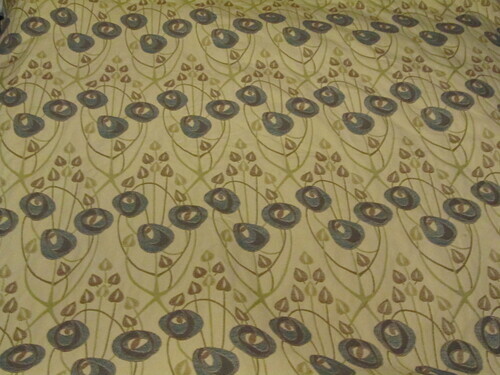 In fact I couldn’t resist buying some Mackintosh inspired fabric from the nearby Manders shop. I got a couple of yards in their sale, at a seventh of the original price! I have no idea what I’m going to use it for though. In this Saturday’s Guardian Review section the author of Madame Doubtfire, Anne Fine, talks about her hero Robin Williams, you can read the article here. Elsewhere, in the Guardian Weekend magazine there’s an article by the author Esther Freud. I haven’t read anything by her and after reading the article I doubt if I ever will. 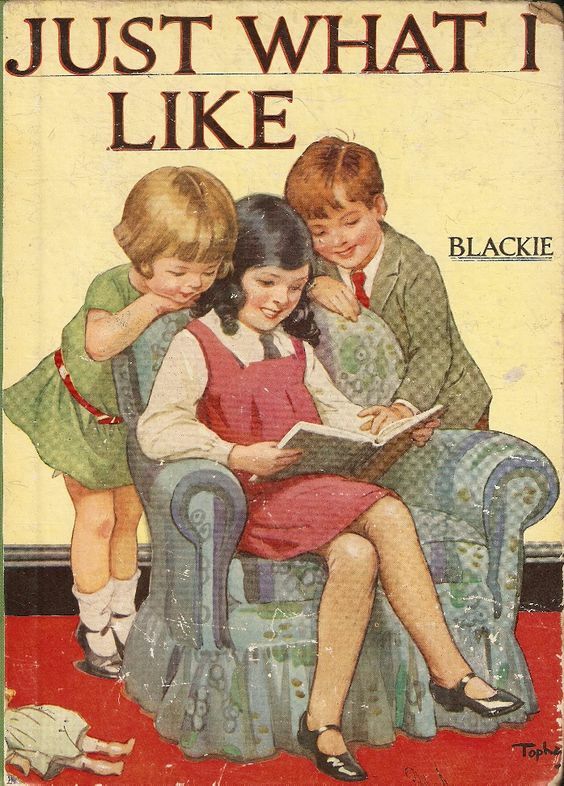 Her new book is called Mac and Me and the ‘Mac’ is actually Charles Rennie Mackintosh. I can’t help thinking that this book must have been put together in tearing haste to take advantage of Mackintosh having been in the news recently. Freud briefly owned a cottage in Suffolk which she discovered had been an inn which Mackintosh had stayed in at some point, talk about tenuous links! I have no idea what Esther Freud’s writing is like but given that she states towards the end of the Guardian article that the Glasgow School of Art was Mackintosh’s one and only project, I certainly don’t think anything of her research skills. Mackintosh may not have been a prolific architect but he definitely designed more than one building. 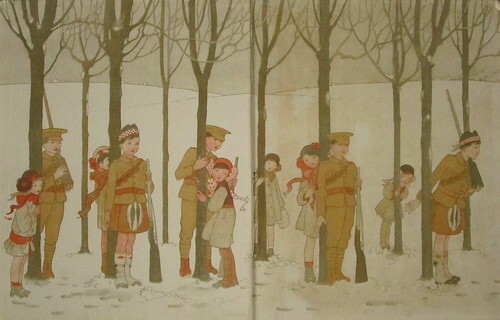 There’s the Scotland Street School in Glasgow and Hill House in Helensburgh as well as a few houses in England and of course House for an Art Lover was built posthumously in Glasgow’s Bellahouston Park. Such glaring mistakes make me wonder if Freud’s success in writing is solely because of that name ‘Freud’ with so many well known Freud relatives it certainly can’t be a disadvantage anyway. Not so much standing on the shoulders of giants as scrambling up the ankles of your ancestors. It makes me wonder why her editor didn’t point out just how wrong she was or do the editors at Bloomsbury not actually do any editing? 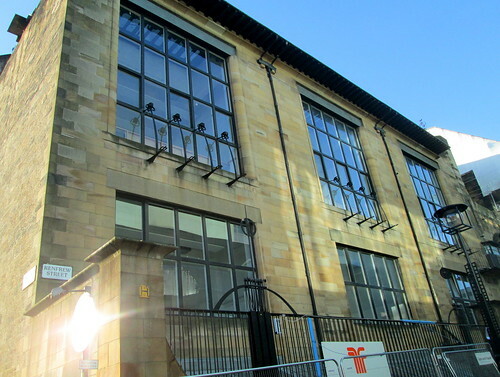 I didn’t have the heart to blog about this before now, but on Friday the Glasgow School of Art caught fire, you can read about it here. I’m never sure about how well known Charles Rennie Mackintosh is elsewhere, but in Glasgow we love him and his work. The School of Art was his masterpiece of course and I was shocked when I heard that it was on fire, I was standing in the kitchen cooking, with Radio 2 on and the traffic report woman just blithely said that there was congestion in some parts of the city because the art school was on fire!! I ran into the living room to switch on News 24, hoping that it was the newly built part of the art school which was on fire, but no – it was the Mackintosh building, and when I saw the flames bursting out of the roof and heard that the fire had started in a basement, my heart sank. 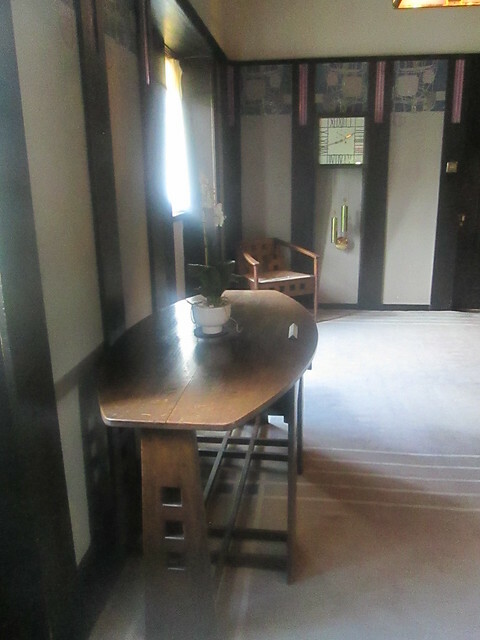 Not only did Mackintosh design the building but he also designed all the fixtures and fittings, clocks, lights and furniture. The good news is that the fire brigade say they have managed to save 90% of the structure but the bad news is that the library is entirely destroyed. They think that about 70% of the contents of the building have been saved, but that’s still a lot lost. Apparently the fire brigade got there within 4 minutes and they put their lives in danger by entering the building to fight it, and you can’t ask more than that. Thankfully everyone got out safely and they think that the students’ work has been saved. I’m now so glad that I did go to see the building a while ago, you could go and gaze at it whilst the life of the school carried on around you, I also attended an auction of art noveau furniture and decorative ware which was held there a few years ago. As well as housing one of Europe’s leading art schools, the listed building is a tourist attraction in its own right. Completed at the turn of the 20th century, it was voted the best building of the past 175 years in a poll by the Royal Institute of British Architects (Riba). The damage will be repaired of course, but it won’t be the same even although it might look exactly as it did, minus the 100 years of wear and tear which was also part of its charm, it was a cherished building but it was still a work place, not preserved in aspic. 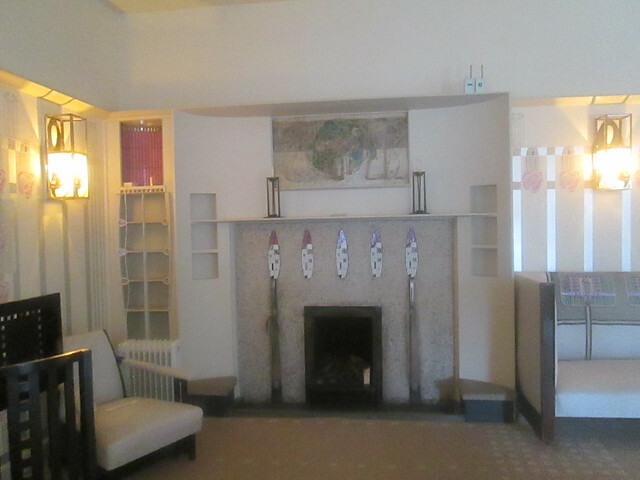 You can see what was going on on Friday here and scroll right down to read about Mackintosh and see some of the library. 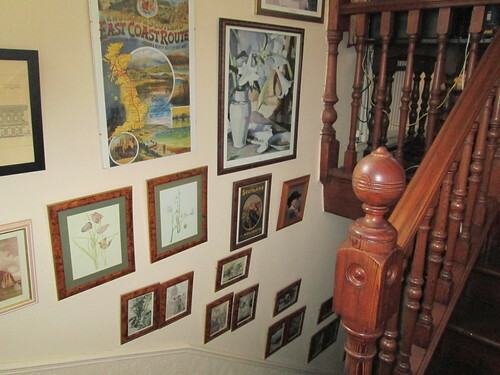 We’ve lived in our house for over 25 years now but I realised that we have hardly any photos of some parts of it so I thought I would take some for posterity as we plan to downsize at some point in the future. The house is around 110 years old, so Victorian/Edwardian. 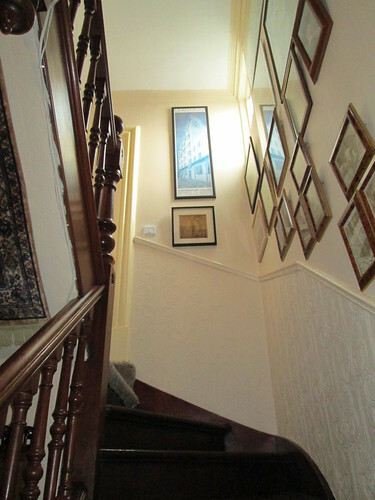 The photo above is of the bottom of the stairs, they lead up to a half-landing – or mezzanine as estate agents call it. They lead up to the bathroom, yes, halfway up/down the stairs is the place where we sit. I’m going to spare you a photo of that though! I suppose it’s a bit of a quirky house, I don’t think too many houses have a window right at the top corner of the wall on the stairs. You can’t see it too clearly here though. In fact you can’t see much. 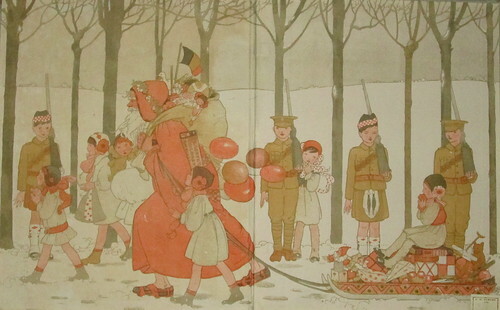 The small prints are all of Peter Pan illustrations by Arthur Rackham. 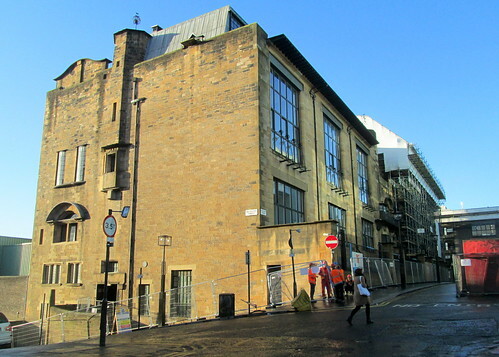 The large poster facing you is of a Charles Rennie Mackintosh building – The Daily Record Buildings in Glasgow, (the Daily Record has moved somewhere else now) and underneath it is a print of Margaret Macdonald Mackintosh’s The White Rose and the Red Rose. I took the photo above from the half landing. As you can see, just about the whole wall is covered with prints, almost all of them with a Scottish link. 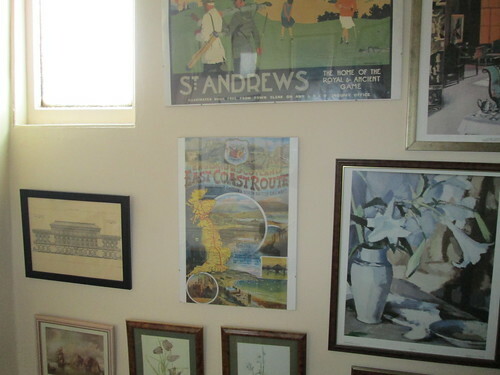 C.R.Mackintosh flower prints, Scottish British Rail travel posters and some Scottish colourist prints in the shape of The Orange Blind by Cadell and Lilies by Peploe. It occurs to me that it’s the sort of thing which you would expect to see in the home of an exiled Scot, rather than one who lives in Scotland – as I do. And there’s that window I was telling you about. It doesn’t open and I have to drag ladders out to clean it so that doesn’t happen too often, but it does throw some light onto the stairs, which is handy. 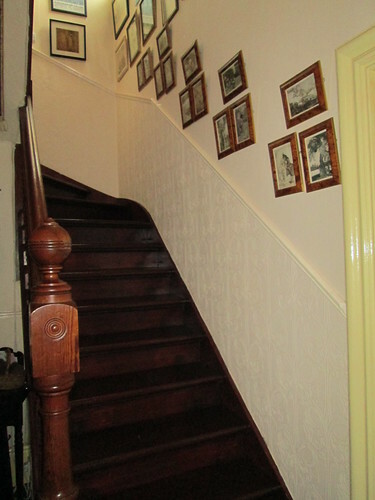 Next time I’ll take some photos of the top of the stairs, which you can just see in one of the photos. At the moment it’s a bit of a guddle (mess) though as our main computer is still on that landing – its winter headquarters. Don’t you just love Kermit’s nephew Robin singing this song by A.A. Milne – Halfway Down the Stairs? I do anyway, so here it is. It was the last antiques fair before Christmas at the Highland Showground at Ingliston near Edinburgh yesterday. We went along, not really with the intention of buying anything for ourselves because we’ve got enough ‘stuff’ really. But I thought it might be an opportunity to get some Christmas shopping done. Yes, I think that’s the first mention of that dreaded ‘Ch’ word here. The BBC happened to be filming a Bargain Hunt programme at the time, unfortunately by the time I realised I could take some photographs of the proceedings – Tim Wonnacott had disappeared. But here are a couple of photographs of the blue team and their ‘expert’. 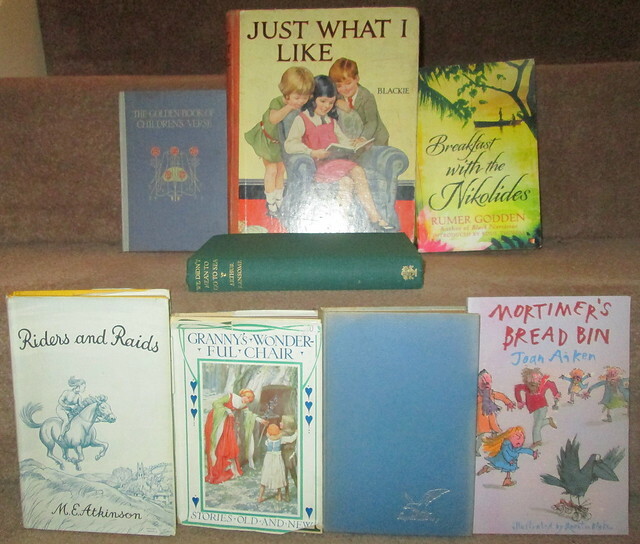 I ended up buying some books which I will get around to reading some time but I really bought them because of their bindings, and also they were really cheap. Charles Rennie Mackintosh designed book-bindings for Blackie and Son and I’m sure these are some of his. I think they’re lovely anyway and I didn’t get around to reading Carlyle’s Heroes before I had to take it back to the library. This edition cost me a whole 1 of our Earth pounds! I also bought some more old prints of Dumbarton Castle, Loch Lomond and one of Ravenscraig Castle. One Christmas present was bought, which I can’t say anything about because I want it to be a surprise. Thankfully we are sensible at that time of the year and really just stick with giving presents to close family members otherwise it just gets too silly and expensive. So anyway, a good day out was had by all at Ingliston Antiques Fair. The best laid plans of mice and men gang aft agley – as good old Robert Burns said, and so after really looking forward to the autumn holidays we ended up not being able to go away, just as well we hadn’t actually booked anything. When a good builder knocks on your door and says he can fit you in earlier than planned you just have to grab him rather than wait until the spring. So the west, Oban and the Isle of Mull will have to wait. We only managed one day in Glasgow instead and chose to go to the Kelvingrove, my home from home. They are very relaxed about people taking photographs unlike some places and I thought you might like to see some Charles Rennie Mackintosh designs and other Scottish art nouveau designers. This is from the original Miss Cranston’s Tearoom. I love the designs but I’m sure that Miss Cranston must have asked him to design chairs which were uncomfortable to sit in for any length of time, fair enough I suppose, she obviously wanted people to move on so she could make more money. These gesso panels by Mackintosh’s wife, Margaret Macdonald, are lovely – ethereal women are a recurring theme. I think the stained glass is my favourite, it’s such a pity that the chair is positioned so badly here. This type of stained glass is typical of what you commonly find in a ‘middle class’ Edwardian tenement building in Glasgow. This one is small and quite plain compared with some. The front doors and vestibule doors usually have stained glass or painted glass panels in them. I think this one came from the bottom of a window. The panel would have been fitted over the bottom of the glass from the inside. You can still buy panels like these quite cheaply from reclamation yards. I’ve got a few painted glass ones which I intend to make into light boxes – some day! If you’re into CRM and The Glasgow Style you’ll want to visit Kelvingrove.